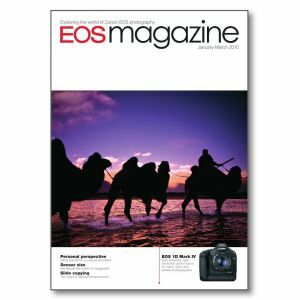 Add this issue to your photographic library for information on the Canon EOS-1D Mark IV. Plus techniques on portrait mode, quick control on your EOS camera, tilt-and-shift lenses, sensor size, moonlit photography and slide copying. New products EOS-1D Mark IV; Wireless File Transmitters WFT-E4 II and WFT-E2 II. Professional showcase Travel photographer David duChemin is not afraid to get personally involved if it helps him tell a more compelling story. Portrait modes Portraiture can be an intimidating subject for anyone who hasn’t tried it before. But it is a surprisingly easy discipline, and with a little bit of effort you can achieve good results right away. Quick control A small feature on some of the latest EOS cameras makes it easier for you to be in full control of many of the important features and functions. Tilt-and-shift Canon’s two latest tilt-and-shift lenses are aimed at professional landscape and architecture photographers. But what is tilt-and-shift and why is it so useful? Sensor size There is a lot of confusion about megapixels and sensor size, and the impact each has on image quality. Andrew Gibson clarifies the advantages of full-frame and cropped sensors. Moonlit escape Photography by moonlight is all slightly weird – both the actual capture, which involves roaming the countryside at night, and the images themselves. David Clapp introduces this new world. Solutions Disk Don’t discard the EOS Solutions disk which comes with every EOS camera. It’s packed with software which, if you bought commercial equivalents, could cost more than the camera! How was it shot? Exploring the technique behind the image. Photographing indoor dancing tournaments requires both technical know-how and a little bit of luck. Rainer and Simone Hoffmann use various techniques to achieve different effects. Slide copying Do you have a large legacy of 35mm transparencies which never see the light of day? We look at two different ways you can convert these images to digital files for viewing and printing.